With its art-deco inspired architecture, this single-story home has 4 bedrooms, 3 bathrooms, and can sleep up to 7 people -- perfect for small families or a group of friends. The open plan kitchen and living room are modern and spacious. The kitchen has plenty of work space and is the ideal kitchen for whipping up any family meal. 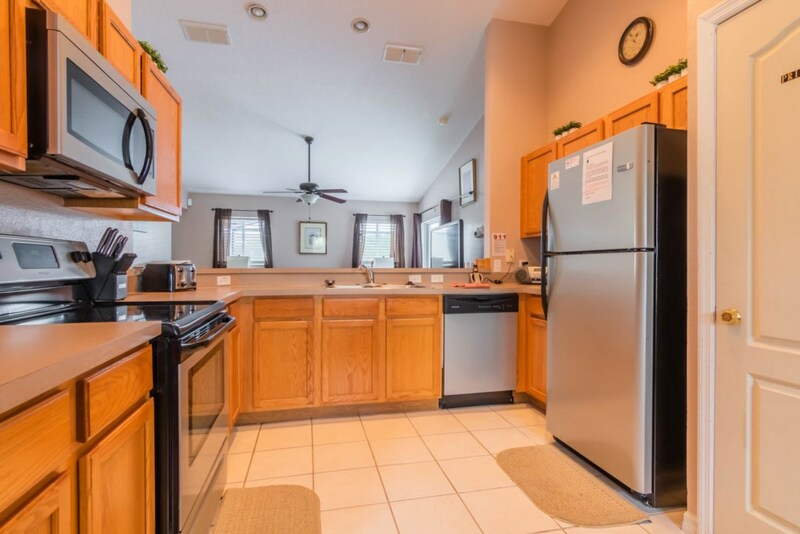 The kitchen is fully-equipped, and you’ll find everything you need to both prepare and eat your meal. Time to eat? 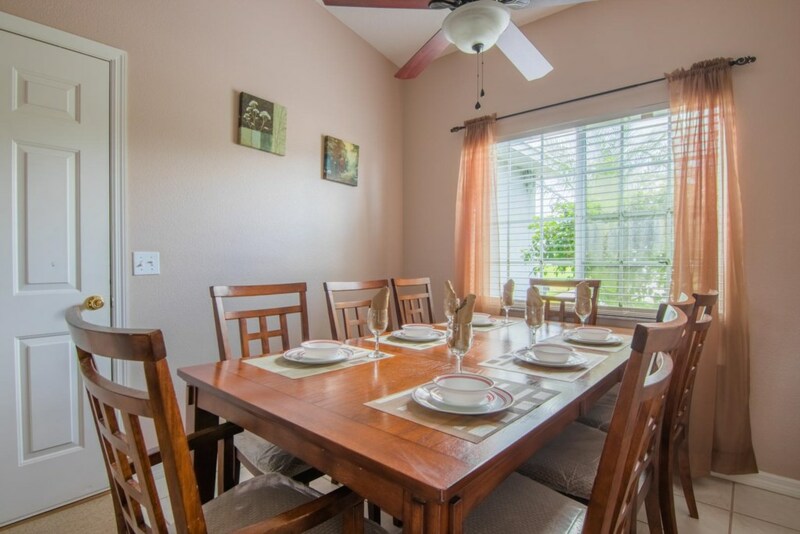 The formal dining area has seating for up to 8 people. 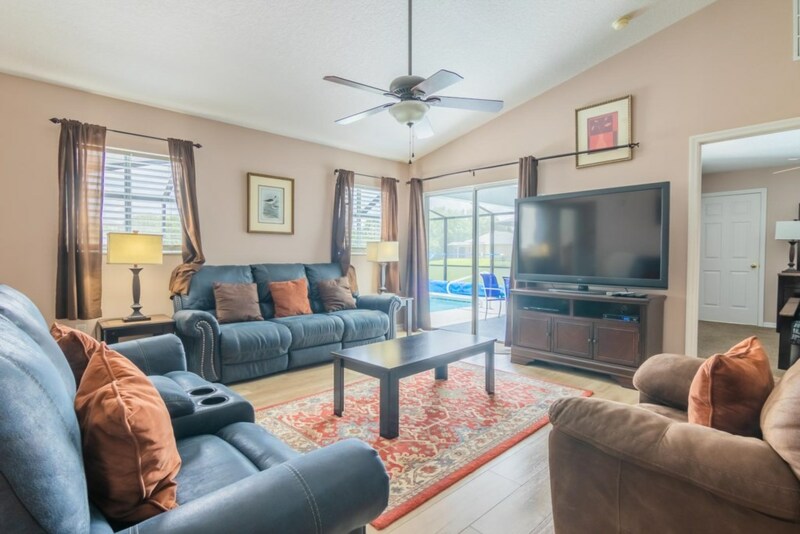 Moving onto the living room, it is cozy, and with a plush 3-seater sofa, a 2-seater recliner sofa, and an armchair that are perfect to curl up into and relax after a busy day at the parks, there is enough space for the whole family to get together. It also has a large, 60” flat screen TV and DVD player for your entertainment. 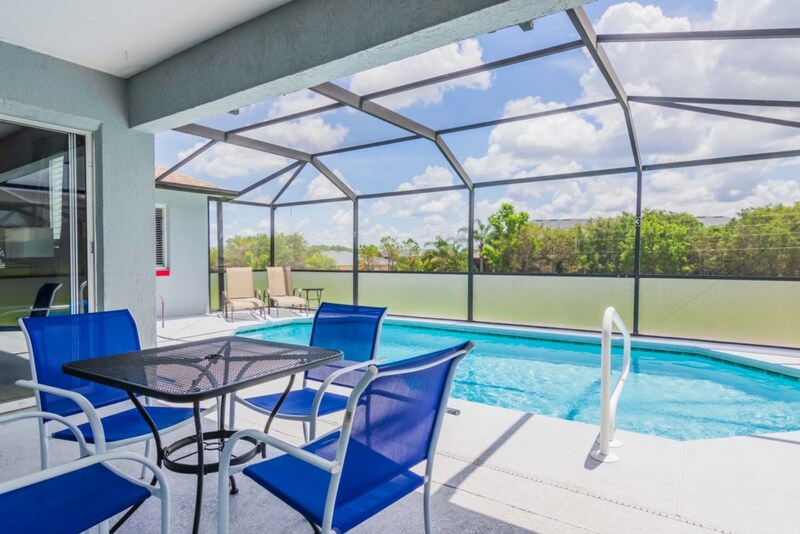 There is a glass patio door that provides direct access to the pool area. 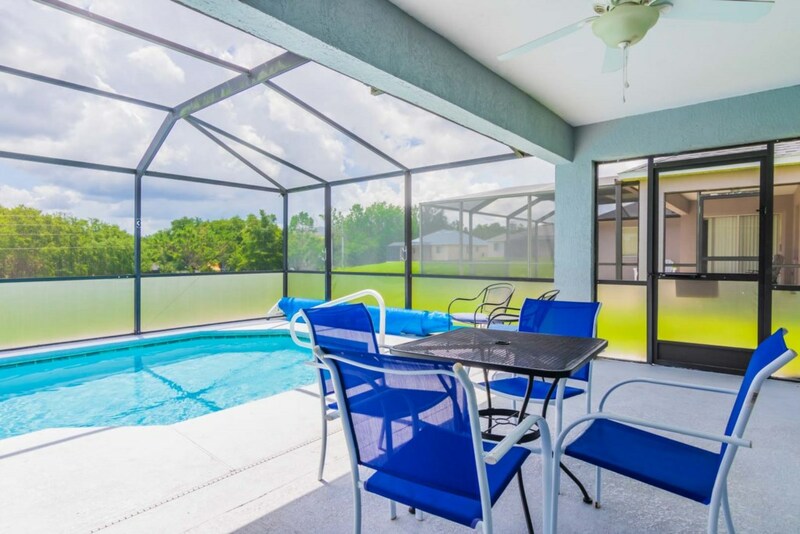 Here, everyone can swim, cool off under the covered lanai, or if you fancy catching some sun, there are 3 cushioned sun loungers to relax on. 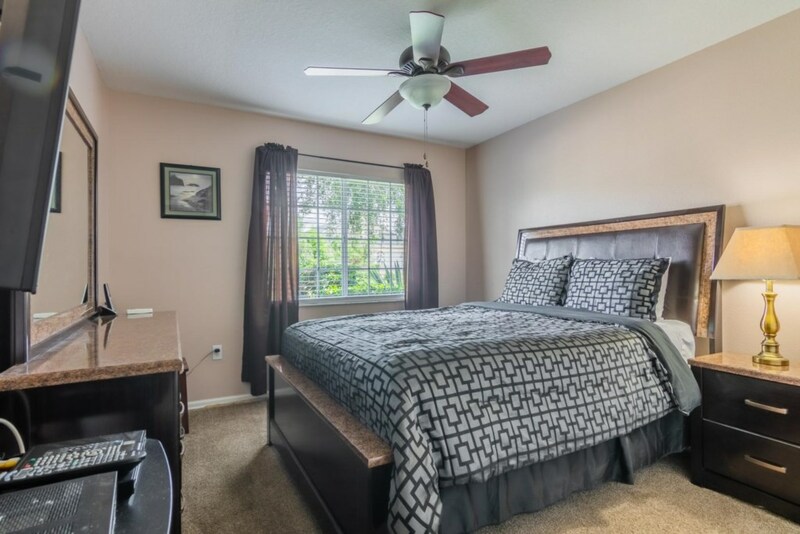 There are 4 total bedrooms. 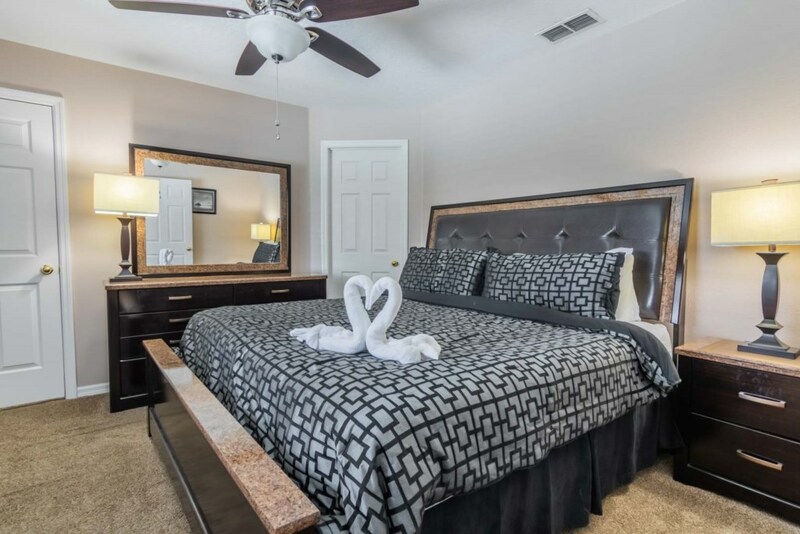 The master bedroom has a smart-looking king-sized bed, en-suite bathroom, and ample closet space. 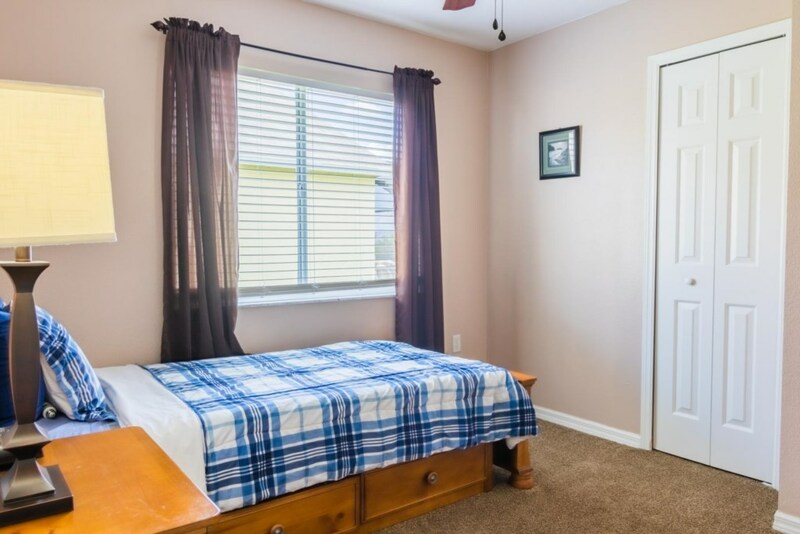 The second bedroom, with its queen-sized bed, is perfect for another couple of someone who wants some extra bed space to stretch out. 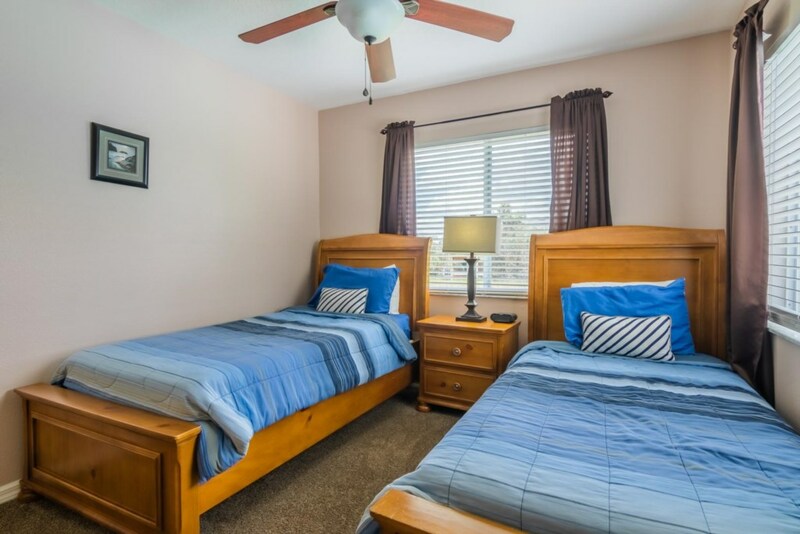 The third bedroom room has a single bed, and the fourth bedroom has two single beds – perfect for the kids. 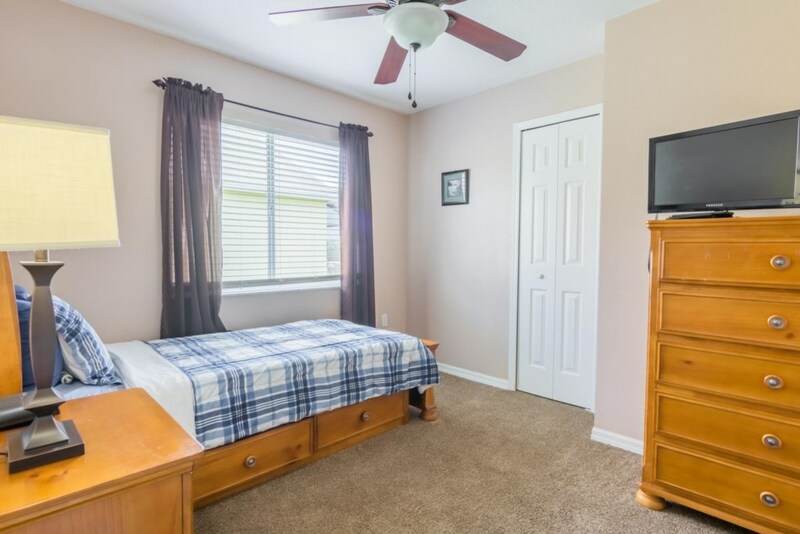 If the 60” television isn’t enough to please everyone, you’ll be please to know that all bedrooms have their own television. 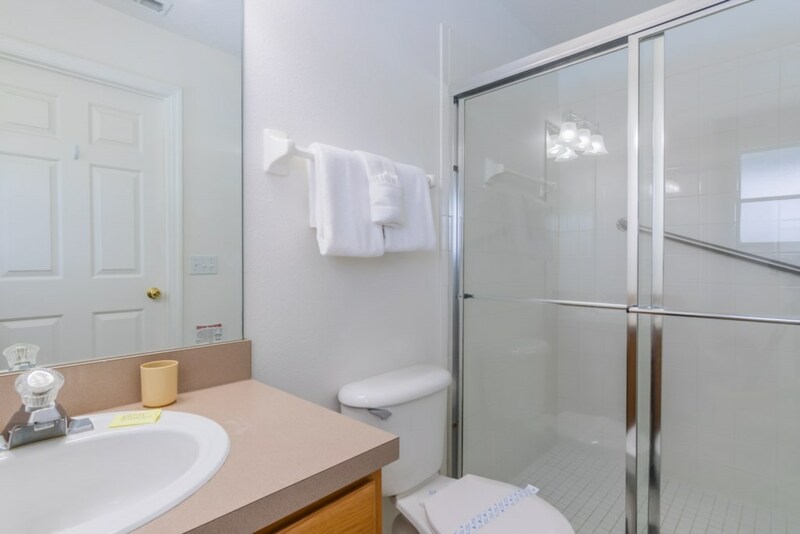 During your stay, it’s almost certain that you’ll have some laundry that needs doing, but don’t worry! 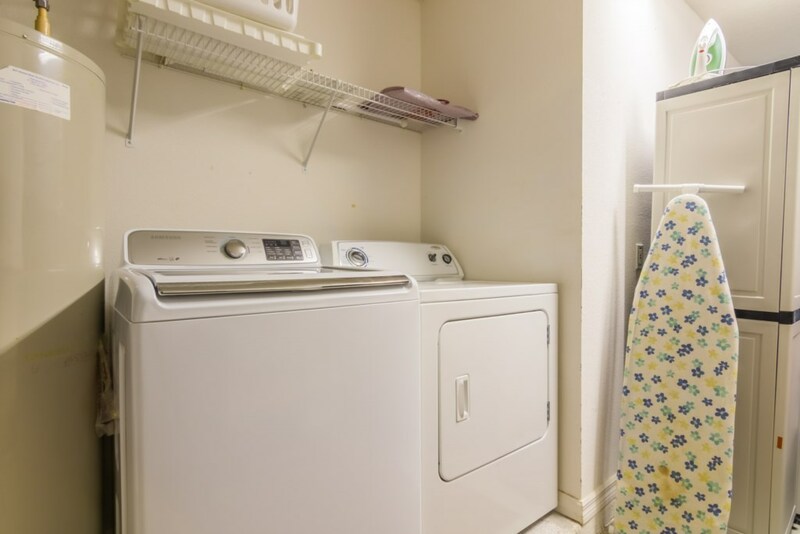 This home comes equipped with a full-size washer and dryer. 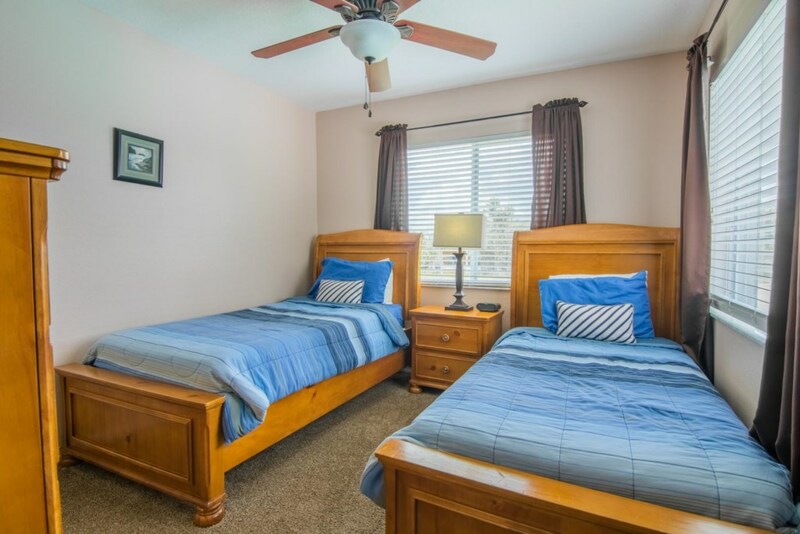 The Hillcrest community is a great choice for your vacation rental home. 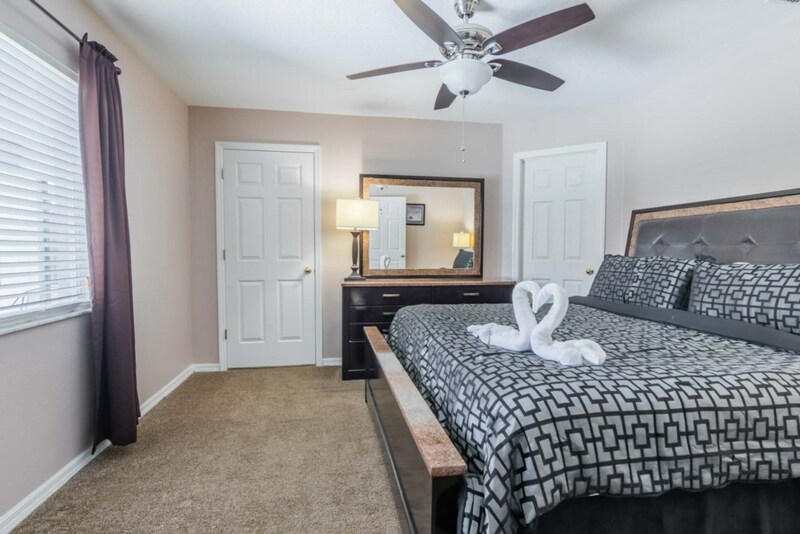 Hillcrest has a pleasant mix of permanent residents and vacation guests have chosen Hillcrest as their prime location for a home. 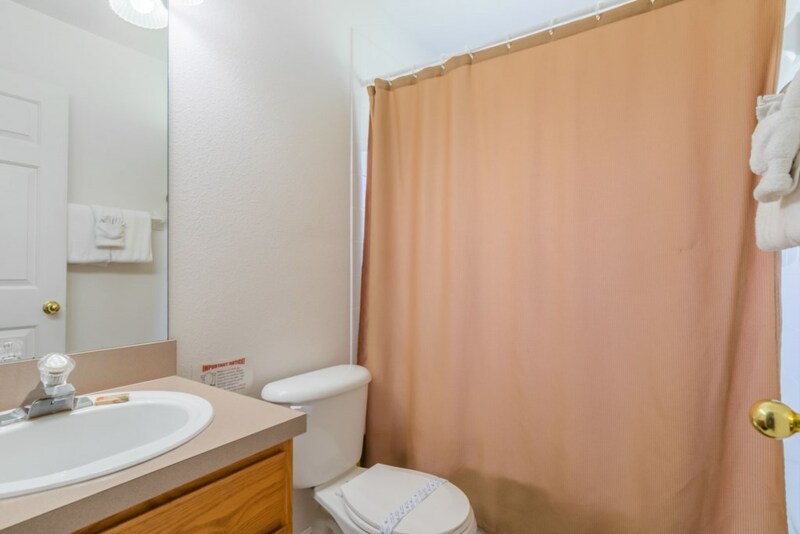 Hillcrest community is located off Highway 27 south and just 1.5 miles south of Highway 192. 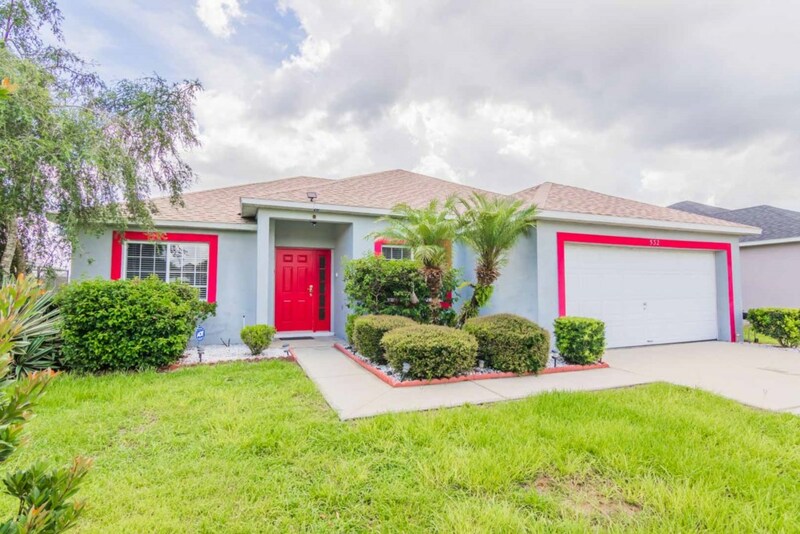 It is conveniently close to shopping, supermarkets, restaurants and minutes from the Disney theme parks, but still retains its quiet and peaceful charm. 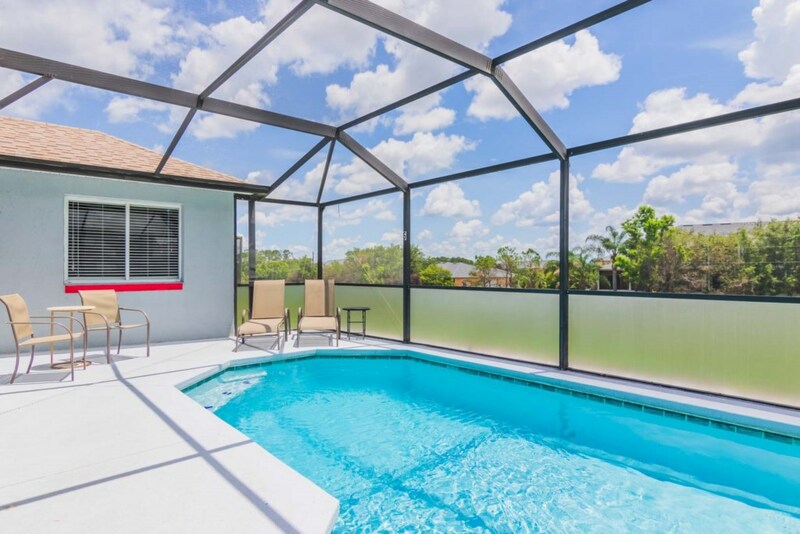 I-4, just 4 minutes away, provides quick and easy access to beaches near Tampa on the West Coast or the Space Coast beaches near Cocoa and Melbourne and all of the Central Florida attractions. 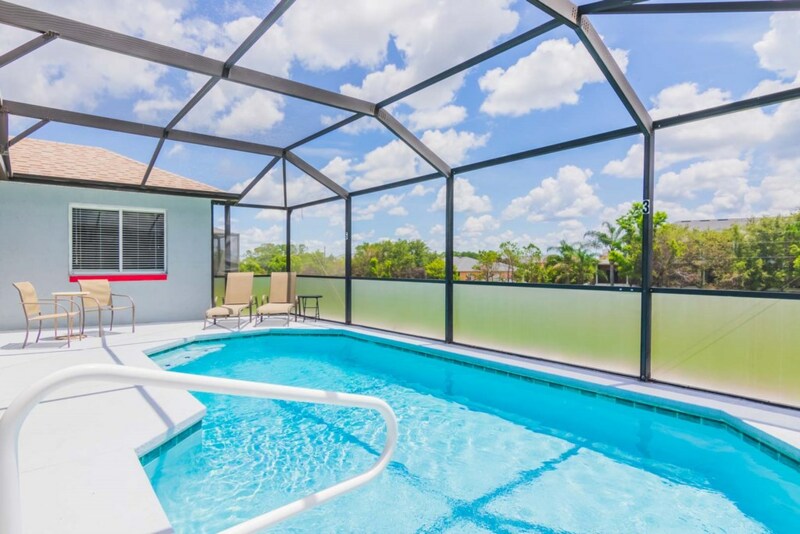 We have rented Florida Vacation Homes from I.P.G. 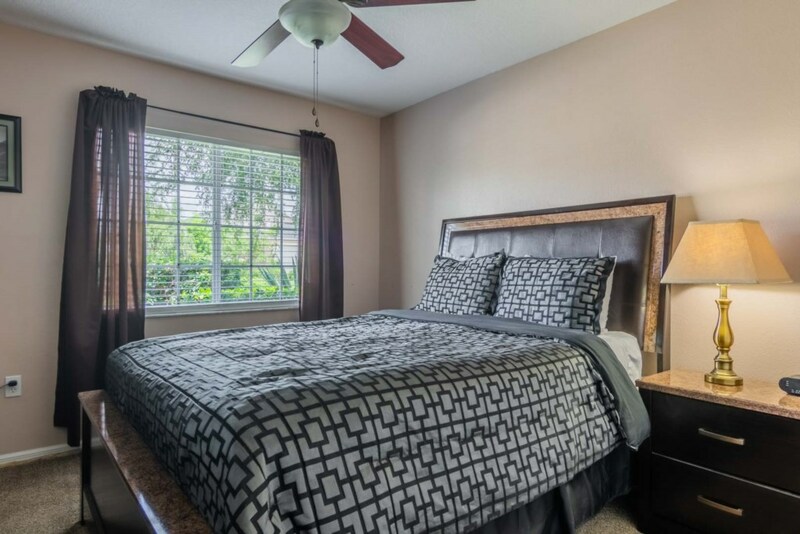 for something like 12 years and have always appreciated trusting them to give us clean, nicely furnished and well decorated homes This year our house was not as large or fancy as previous homes we've rented, but more comfortable, and filled our needs perfectly. We especially appreciated having two very comfortable davenports in the living room with kick outs. The other very important thing for us is having a good mattress to sleep on, which this one did. The living room TV was huge. We did find it a bit complicated to figure out the cable system remote control. There were TV's in each bedroom but in our case we didn't use them. The kitchen was well stocked with dishes and cooking supplies although we did little cooking. The very nice gentleman that was in charge of our home stopped to see if there was anything we needed. He asked us to let him know if there was. We didn't, but how nice to know he was there for us. Thank you I.P.G. 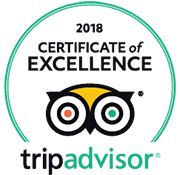 for being such a reliable place to rent from. We'll be back. Clifford and L. Marcie Trent Cedar Falls Iowa. 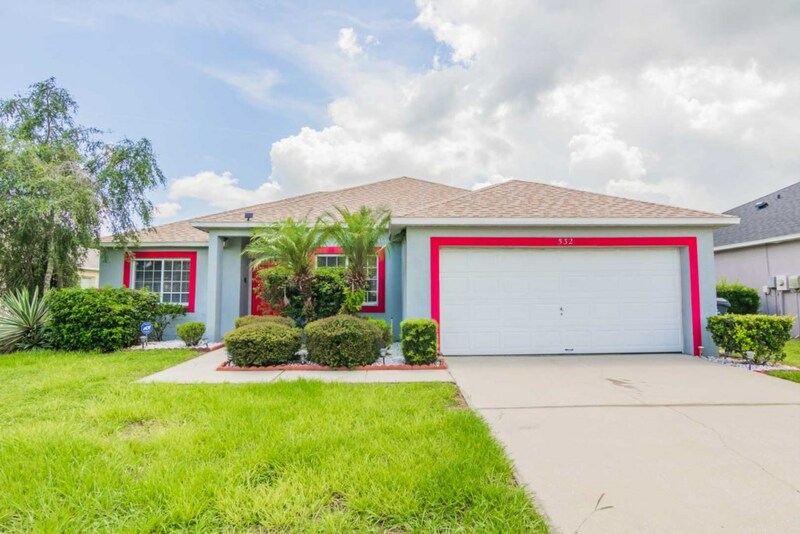 Great location close to Disney, good places to eat, points of interest, spring training games and golf courses. Linens and towels already there for your vacation. 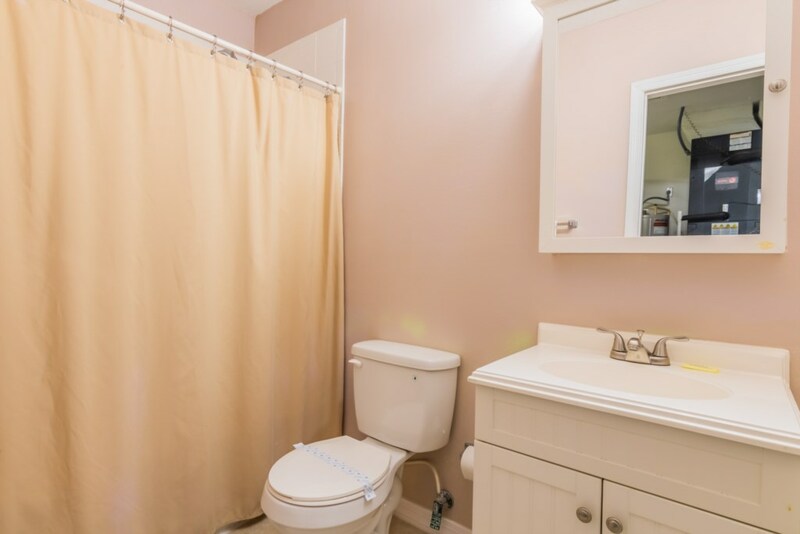 Third bathroom great when you have a crowd.